Learn to identify this pest with these helpful pictures. This article focuses on the brown marmorated stink bug (Halyomorpha halys). Shape - characteristic shield shape. The immature bug, called a nymph, is yellow and red with red eyes. As it grows, the yellow lightens to off-white. Read more about what a stink bug looks like. How Did I Get Stink Bugs? Stink bugs have an uncanny ability to slip into homes through torn screens and door cracks thanks to their flat body shape. When the weather turns cold, these pests overwinter indoors in hopes of surviving until the spring. The pests gravitate towards light and often gather on sunny exterior walls. At night, porch lights attract them to houses, where they use gaps in the siding to head towards warmth indoors. More about what causes stink bugs. How Serious Are Stink Bugs? Stink bugs can damage ornamental plants, fruit trees, and gardens, but they are more of a nuisance than a threat to people. They do not cause structural damage or spread disease, but they do cause a few issues. Glands between the legs of stink bugs emit an odor that gets much stronger when the pests are smashed. They frequently die in light fixtures, filling rooms with a bad smell and forcing homeowners into frequently clean-up. They also fly around rooms and crawl on walls and ceilings in large numbers. How Can I Get Rid of Stink Bugs? 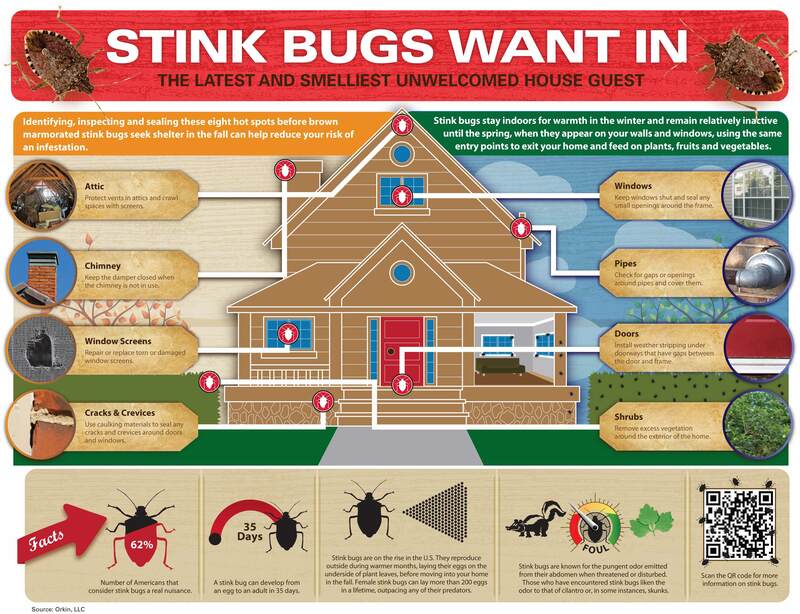 The Orkin Man™ is trained to help manage stink bugs and other pests. Since every yard or home is different, the Orkin technician will design a unique program for your situation. For homes and businesses, stink bug treatments generally focus on two species that are very bothersome: the brown marmorated stink bug (BMSB) and the kudzu bug. Both of these insects create troubles for home and business owners when the pests fly to structures looking for overwintering sites. Therefore, pest management professionals focus on treatment methods that will control the bugs or help prevent them from getting inside. In most situations, the best treatment for stink bugs is preventing them from getting inside to their overwintering sites. Your Orkin technician will probably recommend sealing all cracks that are more than 1/8 inch wide, screening or repairing existing screens over roof vents, gable vents, windows and doors and installing door sweeps. Chemical products can be applied around possible stink bug entry points. Based on your inspection, initial application and reapplications of products may be required to treat other stink bugs that fly to the property and attempt to get inside. 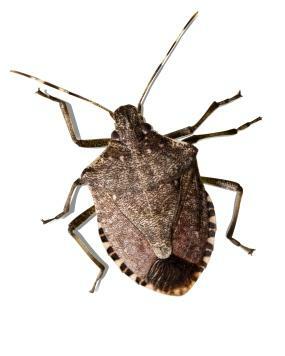 Large numbers - Homeowners often first detect stink bugs by their mass invasions in the fall. Sunny walls - They turn up on sunny sides of homes where they warm themselves. Crops - Growers often detect them by the damage they cause to their crops. Read more about what stink bugs eat. Inside homes - Besides being an agricultural pest, the brown marmorated stink bug is often a pest in homes. In late summer, the adult bugs gather on homes. The bugs are seeking sheltered places to spend the winter. In walls - They spend the winter hiding inside the walls or in the attic or crawl space. When spring comes, the stink bugs become active. As they begin to move around, some of them emerge into the living space. The brown marmorated stink bug (Halyomorpha halys) is native to Asia. It has been an agricultural pest in China, Japan and Korea. It was first collected in the United States in 1998. It is now found in many parts of the country from Maine to Mississippi and from Oregon to Florida. Seal cracks - Homeowners can discourage the brown marmorated stink bug from entering the home by sealing as many entryways as possible. Cracks around doors and windows can be sealed with caulk. Screens - Vents in attics and crawl spaces can be protected with screen. Any torn or damaged window screens should also be repaired. Doors - Weather stripping can help seal gaps under exterior doors. Overwintering - Unfortunately, once stink bugs invade the voids of the home to overwinter, they can be difficult to remove. 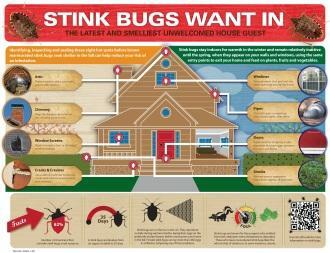 More info on stinks bug in winter. How Long Do Stink Bugs Live? What Do Stink Bugs Eat? What Does a Stink Bug Look Like? Where Do Stink Bugs Live?